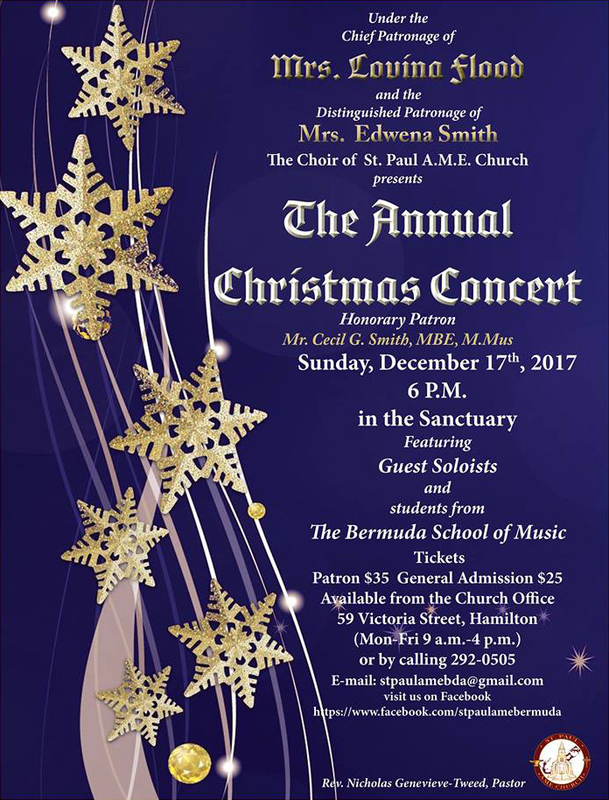 Under the chief patronage of Mrs. Lovina Flood and the distinguished patronage of Mrs. Edwena Smith, the Choir of St. Paul A.M.E. Church is getting set to present their annual Christmas Concert on Sunday, December 17th at 6.00pm in the Sanctuary. The event will feature guest soloists and students from the Bermuda School of Music, and tickets are $35 for patrons, and $25 for general admission, and are available from the Church Office, 59 Victoria Street, Hamilton from Monday to Friday from 9.00am to 4.00pm. For more information call 292-0505, email stpaulamebda@gmail.com.